Blocks are beneficial for both beginners and seasoned yogis. Utilize the 2 blocks for balance and stability while performing more difficult poses. Enhance flexibility with the comfortable EVA Foam blocks. 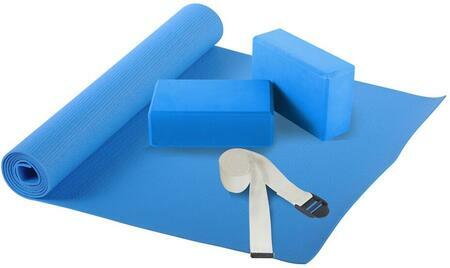 Tear resistant, comfortable mat protects your knees while exercising. Perform mountain climbers and higher intensity intervals with the durable mat built for Pilates, yoga, and fitness exercises. 100% cotton yoga strap is perfect for enhancing stretches and opening up your muscles for a relaxing and therapeutic stretch. Durable strap is designed to withstand stretching and intense sessions. Yoga has been shown to improve cardiovascular health while benefiting mental and emotional health. The comfortable set can help achieve your goals while you improve your health. Everything needed to improve your yoga and Pilates skills. The set will assist in achieving your unique goals while helping to deepen poses and improve flexibility daily.